I want to write about what it has been like to rehab these two little creatures, these dogs, terribly treated prior to our home, and the work to bring them to flourish. Or mostly flourish. As The National sang: Once ruined, baby you stay ruined. 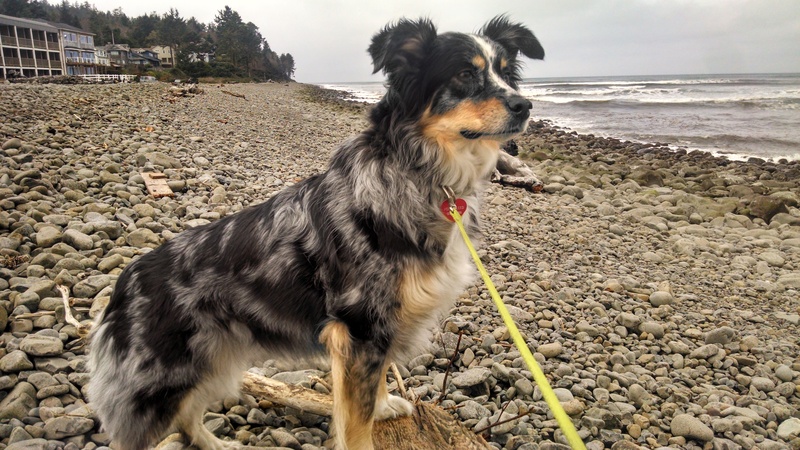 While they now thrive, especially Polly, deep parts in both dogs remain vigilant for what their cells remember – muscle memory, conditioned response, PTSD. These have been the tools used (applicable in most relationships): calm, consistency, patience, schedule, compassion. Some of these might read as synonyms, but are not when employed as verbs. We are not a yelling people in our house. At worst, we bicker. And we hold no grudges, pull away, ignore. No one goes silent as an attempt to punish or test. It took the dogs very long to realize that no explosive reactions would happen. If a door slams, it is an accident. If a book slipped or cup broke after she first arrived, Polly would cower in a corner, looking up, bloomed eyes from over a lowered nose, tail tucked and ears slick against her head. She has not done that for years. She would shake and cower if we moved too quickly or, if our voices raised at the TV for sports, she would dash from the room. Fred is smaller, and came to us far more traumatized than Polly had been. He has seizures, possibly brought about from head trauma, still dislikes his head being touched, and has poor vision. After he eats, he sits and cries. We don’t know why and never will and no amount of consoling him has helped, though the crying no longer lasts for much length of time. He still sometimes rushes away if we move too quickly near him, but not always. More often now, he sits and stares up at us, uncertain at worst. And, observing his worry, we scoop him up in a firm, secure hug. I know that had we (as stewards of him) been different, more erratic, less patient, we would have driven him over the emotional edge he was occupying when we found him, and he would be a neurotic, chaotic dog in constant misery. His fright has lessened considerably; he knows we won’t hurt him physically or psychologically. His mistrust of women, and strangers, is extremely lessened. He even becomes curious now and seeks us out, and that is something that levels me to see. While he starts off the night sleeping in a crate, at some point he joins us on the bed, and we often wake up with his head between ours. 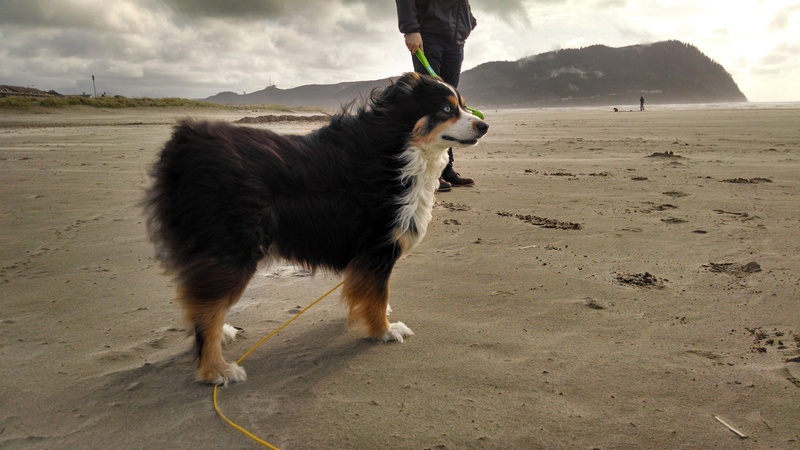 Last week we stayed at the Oregon coast. The Oregon coast is never warm, not truly. It is windy and fairly wild, and often rather stunning. In colder months it is sparsely populated. 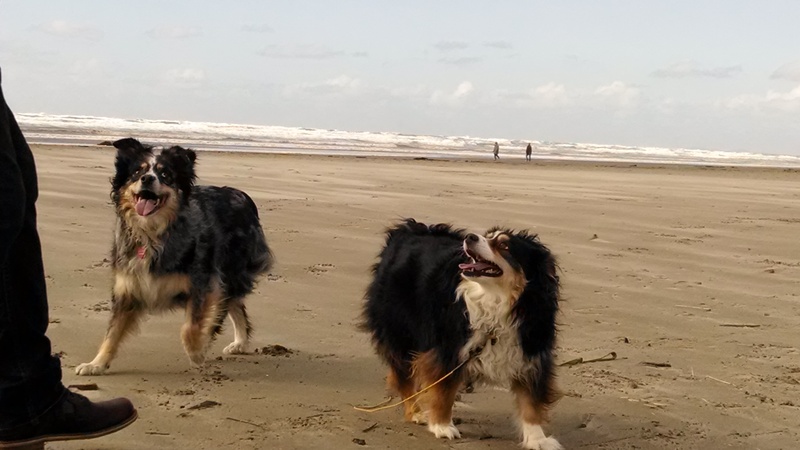 We took the dogs with, playing each day on the beach. No fences, just expanse, and a ball to chase. They were delighted, and we are delighted to witness their happiness, their trust and thriving. It humbles and levels me to watch. If this all reads like a lament, in part it is. And I knew it even while we were at the beach. In 5.5 months our first child will arrive. I know from both simple logic and the reminding of others, that soon our dogs will be largely ignored out of necessity and for quite some time. At the beach, I needed to see how happy they can be, their capacity for it, how much they have changed. I know that what I see in them, the remains of the trauma, is much about me and my own. It’s sort of Lacanian – needing to find a sense of mastery over something I had no ability to control or effect. The home I needed to actualize for them is the home I have also needed to live in, with patience, calm, certainty, and terminal compassion. For a great portion of my life, I was not so different from these dogs and the state they arrived in, the results of their experience. There is no mystery in that. Both dogs are alert to change. In the first trimester (of this pregnancy), the dogs took turns resting on my torso (in between my bouts of illness), just protecting me. And, whipping their heads about to watch what was in the air around me – perhaps the mutation of physical and spiritual states, or visitations. They sniff me curiously, lay immediately at my feet, bark at anything they suspect might be nearing our house, be it leaf or wind or human. Soon they will be weary with me, late at night with a new mewling, wondering why we are up, why the new one is crying, when it will stop. They won’t understand why I don’t have the time for them I used to. But I know they are both healed enough to love the new little one from a place of assurance, and that despite changes, they remain loved, important, and wholly significant. In a subtle climate, one becomes quick to notice smallest changes; everything we are is about the growing season and how much snow is on the mountain, how high or low the rivers are. Winter has been a worry, on the heels of an odd autumn. Autumn was a prolonged dry spell, with an uncharacteristic metallic sun hanging, and no rain to put the season to bed. The bees were tested with no food left to collect and no signal to huddle inside and wait it all out. Winter has been sinister-dry with the same sun but a brass color with cheap gold overlay. Except the rain has finally come, not in usual constant drizzle, but in sporadic, protracted, great torrents. Enough to startle us from sleep to check the basement, foundation, outside areas. Today I picked up tree parts in our yard, deposited by trees we don’t even have. 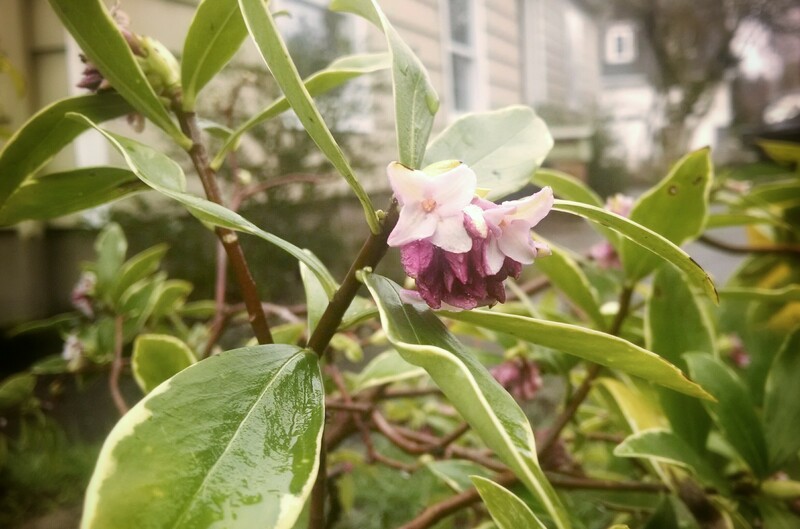 The Daphne is a month late. And now that it has bloomed, those blooms bear brown spots as if it is ready to quit. The usual scent of ambrosia has a sour note like glue; like on its last legs. The ground is past soaked sponges, gone to deep mud for slipping — everywhere is footprints filling in behind. During a national conference of permaculturists 4 years ago, one told me: Yeah, this will be a rain forest in 50 years. I can see it, and I think about it a lot. Our voices, music, TV have to be turned up over downpours. It’s loud. It sounds like we are living in a washing machine. I always speak of moving, but where is there to go? Some of the more hopeful Daphne.